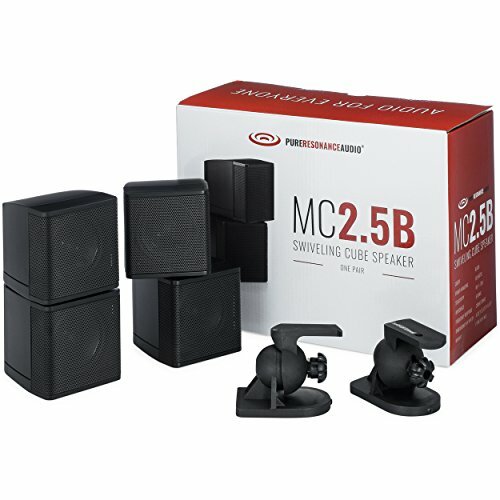 The Pure Resonance Audio MC2.5B 2.5 inch Swiveling Cube Speakers deliver large sound from a small package. Pure Resonance Audio Mini-Cubes can be used for many applications such as satellites, small stereo speakers, surround sound and whole house audio. They are well suited for both home theater and music applications. They're also a great small speaker solution for audio installations in bars, cafes, restaurants, boardrooms and reception spaces as well as offices or retail stores and hospitality applications where space is limited. Anywhere premium audio performance is required to fit within stylish interior design. The satellite dual-pivoting speaker arrays feature revolutionary cube speaker technology to create an exceptionally wide soundstage in the listening area, and bring your home entertainment experience to the next level. The speakers swivel, allowing you to reflect sound off your room’s walls, as well as project it directly into the room. You’re immersed in a surround sound experience similar to what you would experience in a movie theater. The mini-cube speakers are compact, allowing for installation in any room without being intrusive to your decor. Each speaker has two pivoting cubes that each contain a 2.5" driver with rubber surround speaker covered with a metal grille. The magnets are shielded for home theater use near monitors. Great for use throughout the home or commercial space in small or large areas where you don’t want large bulky speaker’s to be seen. Where a full-range bass sound is required we recommend using a subwoofer. Wall mounting bracket(s) are molded of glass filled nylon for low resonance and durability. The speaker mount rotates left and right 90 degrees and tilts up and down 20 degrees. Speaker cable is routed through the wall mount for a clean installation. Each bracket is supplied with a special adapter for dual threaded inserts, allowing for vertical or horizontal positioning of the speaker. Elegantly designed, these multipurpose home entertainment satellite speakers come with adjustable wall mount bracket(s). In addition to the adjustable mounting brackets, these speakers also feature a dual-pivoting array that lets you precisely aim each of the speakers for the ultimate audio experience. With its compact size and high quality audio, these speakers deliver large sound from a small package making them great for areas where space is limited. This package includes: (2) Pivoting left and right dual mini cube speaker stacks (4 - 2.5" speakers) & (2) brackets with mounting hardware.